An intellectual giant is no more. The void is there, never to be filled. From time to time, we have seen intellectual personalities appearing on the horizon of the firmament of the educational sphere, shine for a short while and disappear into nothingness. But not so Professor Sivathamby. He lived and served many causes and still remains a permanent star that will never set. Such was his fame. He was born to a Tamil scholar Pandithar and Saivapulavar T P Karthigesu and Valliammai Karthigesu of Karaveddy, Jaffna on May 10, 1932. In a span of almost eight decades his life was a Himalayan climb to success, till he reached the peak of fame and remained there until his demise in 2011. That sums up the status of an erudite scholar like Professor, Sivathamby. Being the elder son of Pandit and Savivapulavar (Renowned poet of Savaism) T P Karthigesu, it was not a difficult task for him to step onto the first run of the ladder of learning with ease. It is an amazing feat on the part of the young scholar to show his prowess and succeed in many fields. His knowledge grew in direct proportion to his physical growth. To start with, he was a teacher. Those who were fortunate enough to have him as their guru say that he would render a history lesson without so much as referring to a textbook. He never carried a book in his hands when he entered the class. All the facts were computed in his brain cells and used when needed. As a fellow teacher who was not interested in history said, “Sivathamby inculcated in me not only a better understanding of history and the interesting and valuable aspects of the subject but also made it so easy to digest and absorb”. Such was his ability to make a subject considered boring to many as interesting and fantastic as a fairy tale. Professor Sucharitha Gamlath referring to Professor Sivathamny as the greatest living scholar in Tamil recounts an incident which proved how well known, honoured and esteemed was Professor Sivathamby in keeping with the words of Avvaiyar. It seemed Professor Gamlath once met a Canadian Professor of English who had come to Colombo to learn an old Tamil text from Professor Sivathamby. As it was the worst period of the war in Sri Lanka Professor Gamlath suggested he could go to South India and consult Tamil scholars there. 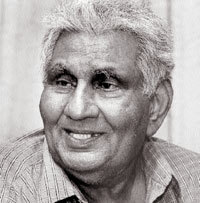 The Canadian replied, “Professor Sivathamby is the greatest living Tamil scholar and it was worth the risk”. The erudite scholar’s name and fame has reached the Western shores. He had done proud by his country, his family, his old school in his native town of Karaveddy and to Karaveddy too. As Sri Lankans and of the same community as the Professor we have every reason to be proud of him. “Nothing is simpler than greatness, indeed to be simple is to be great” - Emerson. “In character, in manners, in style, in all thins the supreme excellence is simplicity” - Longfellow. Perhaps Emerson and Longfellow have visualized a great but simple person like Professor Sivathamby when they uttered these words. Those words of wisdom were a perfect fit on to Professor Savathamby. Any body regardless of their position, status, wealthy or poor, young or old could approach him and be treated with kindness by this man who followed Marxist Principles. He believed in respect of the individual and not for position wealth or power. But it is his colleagues, his underlings, the minor staff, his neighbours and those who sought his help Professor Sivathamby received them with affection with scant respect for post or position and with respect for the individual and render any help or advice sought. When I was writing a book on Jaffna ‘The spirit of the palmyra’, I approached him for guidance. He gave me valuable advice. He was then in poor health but despite his physical suffering he helped me. That was his greatness such incidents and instances are etched and cherished in the memory of many whom he had helped. * Banka Award 1998 by Sri Lanka-Japan Friendship Society for Contribution to Tamil Literature. * Man of the Year Award 1998 for Services rendered to Tamil. * One of the 2,000 outstanding scholars of the 20th Century. * One of the 2,000 outstanding individuals of the 20th Century. Both awarded by the International Biographical Centre Cambridge. * Medal of Honors hallmark 2000 by American Biographical Association. His services were also in many fields. He started as teacher, then he was a simultaneous Interpreter House of Representatives - Parliament, a radio artiste, served in the University as Senior Professor and obtained merit promotion as Senior Lecturer, Asst Lecturer. He was visiting Lecturer in many Universities worldwide. Space prevents completing the list which stretched to several papers. For his PhD at Birmingham University he did ‘drama in ancient Tamil Society’. His award list goes to almost 15 in numbers. His Publication is about 18. He submitted research papers on 44 topics in English. It is indeed a record. How could one man in his life span of three score and ten and a little more achieve so much, in so short a time? The answer lies in his marriage to an understanding lady. His marriage to Rupavathy from Velvetithurai in 1963 was a turning point in his life. Quick to understand his untiring toiling in the field of research and studies, the wife took full responsibility of the home front and his three daughters did not bother him much so he could sit at his desk in carefree mood to pen his thoughts. It is said, ‘Behind each successful man is a woman’. In the case of the professor there were four women behind his success. He served his wife’s native town with as much zest as he served his own hometown. At VVT he was an active member of TRRO Refuge Rehabilitation Organization. CMCH (Committee for Monitoring Cessation of Hostilities) and also in other citizen committees where he went, in whatever capacity he worked, he would just throw himself in and work night and day. This earned him the respect of all around him. At a time the Western world thought Sanskrit was the language of the orient, Professor Sivathamby through his research and talks established the fact that Tamil ranges with Prakrit and Sanskrit. In fact he proved to the world the antiquity of the Tamil Language. He was solely responsible for placing Tamil on the international fora. At his funeral, scholars from Tamil Nadu too flew in to pay their respects to Professor Savithamnby. It was a pride to all Sri Lankans that a Sri Lankan presided over the world Tamil Research Conference held in Coimbatore. Looking back we see a man, a teacher an actor, artiste, dramatist, interpreter Tamil scholar as simple great man in his life playing many parts and the most popular man whose heart reaches out to the weak and the poor, all the elements so well mixed in him and nature could salute him and say ‘This was a man’. He lives through his creative writing in the mind and memories of all who had met him at least once in their lifetime.